ZULI - Numbers. Vinyl EP. Bleep. Having produced quite possibly our favourite UIQ back in Feb 2016 with the Bionic Ahmed EP, Zuli returns to Lee Gamble's endlessly on it imprint with a new six track 12" that follows on from a regular NTS stint and a killer mix for Fact. As with all UIQ drops, Numbers throws a few curveballs that are set to twist and reshape the "club" landscape into bold new shapes. Zuli's talent lies in his seemingly infinite ability to be able to decode the DNA of Gescom style hip-hop and neo-junglist smash em up's into something entirely new, and most importantly deeply refreshing. 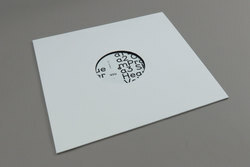 From the cement chewing EVOL meets 154 dub technoise of Foam Home via the Drexciyan underwater electric shocka What You Do, Numbers sees Zuli going even further out than before, perfectly transcending any genre or style like few others can. Numbers is sure to cement Zuli at the forefront of the UIQ crew's impending underground take over, we can't name another label around right now who are pushing electronic music as fwd as these guys. Seriously tipped!